The Blue Note debut of a deeply original trumpeter, this disc is one to rave about, one to push on your friends. Thirty years ago, in 1981, a young trumpeter made his first statement on a major label and blew listeners out of their seats. When Wynton Marsalis debuted on Columbia, it was legitimate to say that you had never heard anyone play with such quicksilver fluency. It wasn’t that the music itself was daringly original but that Marsalis’s voice on the instrument seemed like a sudden, dramatic upgrade in brilliance. 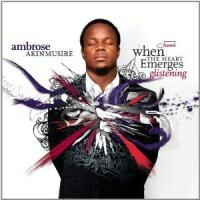 The 2011 Blue Note debut of Ambrose Akinmusire has a similar power and excitement. Akinmusire is older (28), and he already released a very good disc on Fresh Sound New Talent (Prelude to Cora). But it remains that When the Heart Emerges Glistening is a thrilling, dazzling debut -- the emergence of a new voice in the music and a new sound and conception for the trumpet. Akinmusire doesn't come out of nowhere. He played with Steve Coleman’s Five Elements band out of high school, he attended the Thelonious Monk Institute of Jazz in LA, then he won the Thelonious Monk International Jazz Competition. Akinmusire was on the radar. A jazz fan might have seen him coming. But our ears still weren’t ready. So, what’s so special about this trumpet player? Akinmusire combines three brilliant instrumental merits: a virtuosity of speed and fluency, an ability to generate new kinds of patterns and intervals and a freshly conceived approach to sound. Akinmusire doesn’t show off by playing fast and high, necessarily. But he moves like a ninja through an alleyway -- slippery and precise, in front of you, then behind you, then beyond you. His playing on the original “The Walls of Lechuguilla” is flabbergasting. The trumpet-only introduction is like nothing you have heard before. Akinmusire toggles between two notes, playing the higher note with a deadened sound, then begins dropping the lower note micro-tonally Then he starts speeding up the pattern, then complicating it until it is a spiraling flurry. If it reminds you a bit of Lester Bowie, but also a bit of Dizzy Gillespie, then you’re hearing the kind of thrill that I am. It also brings to mind, just a bit, Louis Armstrong’s “West End Blues” as the whole exercise ultimately fuses brilliantly into the composition itself, continuing as a fascinating and percussive dialogue with a great rhythm section. On this tune alone, Akinmusire demonstrates that he is playing in an original jazz trumpet voice. He monkeys with tone and note choice, but he does it at crackerjack tempo. You might be so taken with the dazzle of it all that you don’t realize that he does it all in the service of the composition. But, amazingly, he has that base covered too. The opening tune, “Confessions to My Unborn Daughter”, is nearly as fine. Another introductory trumpet cadenza draws you in with unsettling originality, and then the band makes sense of it all with a grooving but stately triple meter. The rhythm section (pianist Gerald Clayton, bassist Harish Raghavan, and drummer Justin Brown) locks in with a blend of jazz complexity and pop instinct. Like the finest bands out there today, these guys blend the elaborate dialogue of jazz with a stuttering edge of hip hop punch. And then there is tenor saxophonist Walter Smith III, who plays like he is wired into Akinmusire’s brain directly. The two are twinned up like an Ornette Coleman/Don Cherry for the new era. On “Confessions” and on “Henya”, there are moments where the two horn players, separately but also together, bend and choke their notes like virtuoso singers who operate without the boundaries of traditional scales or Western instruments. It might seem kind of avant-garde if it weren’t so utterly beautiful. It’s not bold as much as it is breathtaking. When the Heart Emerges Glistening isn’t a manifesto; it’s just great. Akinmusire’s compositions are appealing, but they often have the jagged trickiness of his mentor Steve Coleman. “Far But Few Between” starts with a series of interval jabs by trumpet which are then answered by a rhythm section pattern that is so skitteringly complex that it seems improvised beyond a time signature (though I’m quite certain it is predetermined). “Jaya” is a mid-tempo groove tune based on a time pattern that sounds perfectly natural but that non-experts will hardly be able to discern. Remarkable it is, then, that these songs are not in the least forbidding or unappealing. Indeed, like all of Glistening, these tunes seem as easy to enjoy as anything from Wynton Marsalis or from a basic mid-60s Blue Note album. A couple of tracks have notably different formats. “Ayneh (Cora)” is a delicate duet for piano (Clayton) and celeste (Akinmusire). The two also duet on “Ayneh (Campbell)” and “Regret (No More)”, where Akinmusire’s trumpet control -- his mastery of tone and pure sound -- serves a heartfelt melody. “My Name is Oscar” is a duet for Akinmusire’s spoken-word evocation of a police shooting in his hometown of Oakland, Calif., and Brown’s drums. Clean and powerful, it works. Tellingly, Akinmusire includes only one standard in this recital: “What’s New”, also a duet. The feeling is outwardly more traditional, with Clayton playing in a modern stride style. But even here, the leader sounds fully up-to-the-minute, not aping his hero Clifford Brown but, instead, suggesting that Brown’s legacy is arcing into the future, decades after it seemed like there might be no new way to play “mainstream” jazz. Kudos to Blue Note president Bruce Lundvall for getting Ambrose Akinmusire and his band into the studio. And kudos to pianist Jason Moran for not only suggesting this but also producing the recording (and playing Rhodes, subtly and beautifully, on a couple of tracks). When the Heart Emerges Glistening is a gem. It’s a jazz record to rave about and to push on your friends. It’s the product of a talent that should send shivers up every jazz fan’s spine. Ambrose Akinmusire has been holding back, finding his voice, developing his band, and now he is here in full bloom. Spring has arrived. You can feel it in your bones, and now you can hear it with your ears.